Sail the beautiful coast of Waikiki and enjoy snorkeling at Turtle Canyon! Sail the beautiful coast of Waikiki and enjoy snorkeling at Turtle Canyon! 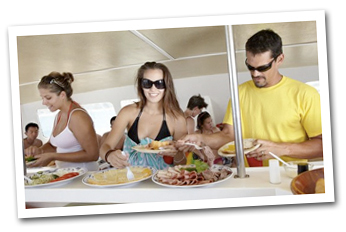 Enjoy a deluxe all-you-can-eat lunch at sea and snorkel in Hawaii's azure waters. Unlimited food and nonalcoholic beverages from our extensive bar; 2 free drinks with alcohol. Our eco-conscious cruise lets you see whales (November thru April), fish, reefs, even green sea turtles at play off the Waikiki coast. Only the Hilton Spirit of Aloha has multiple entryways into the water. 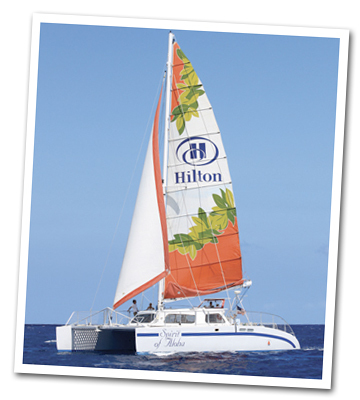 The Hilton Spirit of Aloha is one of Waikiki's newest sailing vessels -- a 54-foot-long by 30-foot-wide high-performance motor-sail catamaran with twin 230-hp engines, a level of power unsurpassed among Waikiki sailing catamarans. 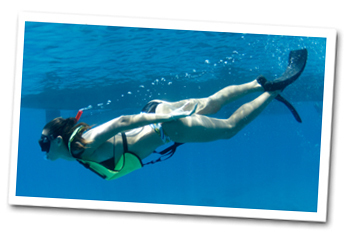 Every guest is provided with use of an inflatable snorkel safety vest and top-notch snorkel gear, including prescription masks if needed. Uncommon amenities for a sailing cat include a full bar with draft beer, a large fully enclosed and covered cabin with table seating, in addition to bench seating in many areas of the boat. Licensed to carry 49 passengers, Spirit of Aloha carries a maximum of 48 instead in order to add an additional crew position for unsurpassed customer service. Crew skills include multilingual, marine biologist, and lifeguard/CPR/first-aid certified, and provides customer service standards set to attain Duke Kahanamoku's "Creed of Aloha" for the utmost in Hawaiian hospitality. No transportation. 4 Hour Hilton Hawaiian Village Parking validated.